Summer is officially here! The sun is high in the sky without a cloud in sight, perfect for a beach escape or outdoor adventure. June is one of the best months to go on holiday and explore the magical Mediterranean, with temperatures soaring and the smell of summer well and truly in the air! Here's our top picks for where's hot in June. Nestled in the heart of Catalonia is the Costa Dorada, the Golden Coast. True to its name this vast stretch of coastline has some of the most beautiful, exciting and stunning scenery in Europe. The rocky rugged coastline hugs the golden sands leading to fantastic blue waters. Here you'll find an authentic taste of Spain with traditional towns and villages that are warm and welcoming. Local cuisine is a mouth-watering medley of seafood dishes. Crafted from recipes hundreds of years in the making, only the freshest ingredients are used! 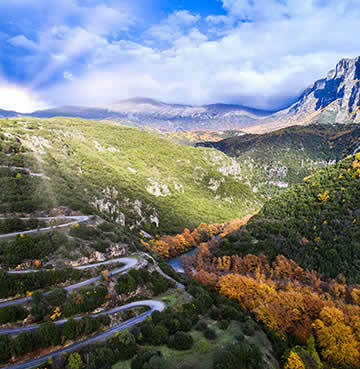 The verdant vineyards, olive groves, hazel and cypress trees that carpet the landscape aren't just for show. Clue's in the name with the Golden Coast – the perfect holiday for beach lovers. The most popular being Playa Llevant. 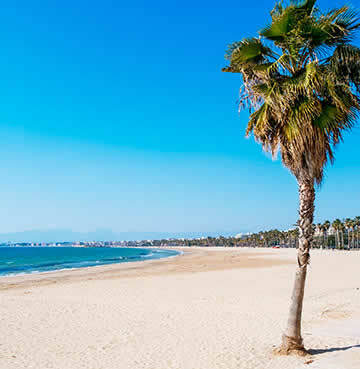 This stretch of golden sand is the focal point for the town of Salou. Everyone is catered for here, The calm, shallow waters make it perfect for young families, whilst the waves and perfect for some wet and wild watersports a little further out. If you prefer a quieter spot, try Playa Ponent, its neighbour. This wide stretch of golden sand is perfect for letting off some steam in the Catalonian sun. Both beaches are home to stunning promenades filled with shops, bars, restaurants and more to help keep you entertained. 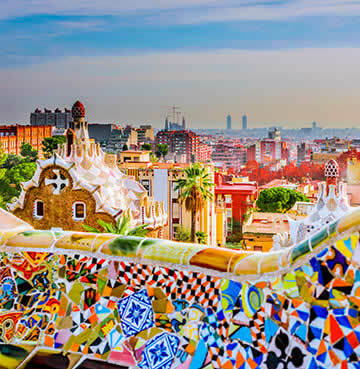 Whatever you do, head north on a day trip and visit Barcelona. The city holds your attention captive with its colour, history, architecture, culture, and day to day life. One attraction you should visit is La Sagrada Familia. An enormous cathedral nearly 200 years in the making, it's still being constructed to this day and one of Barcelona's most famous sights. Afterwards, take a stroll along Las Ramblas should work up quite the appetite as you explore this beautiful city. Sixty miles south of Barcelona is one of the most important historical sites in all of Spain, Tarragona. This city is home to several ancient ruins and offers a unique snapshot into the life of the ancient Romans. Once the capital of Roman occupied Spain, there's a whole host of history available for you to relive. The amphitheatre here is still standing strong, which you can explore along with the forts and the city walls that protected the town for centuries. Arguably one of the biggest attractions in the whole of Costa Dorada is PortAventura World. This is one of the most visited theme parks in Europe! With 42 adrenaline pumping rides, plus a whole host of magic shows, there's plenty to keep the whole family entertained. The theme park is home to the second highest ride in all of Europe – Shambhala – and has a series of gravity-defying drops and camelback humps along the track. Get ready to feel like you're flying! The nearby Caribe Aquatic Park is bound to make a splash with the kids, teeming with steep slides and hours of excitement. It's guaranteed family fun in the sun! 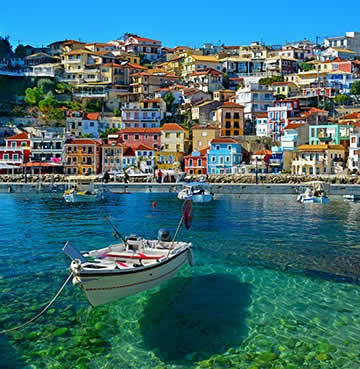 On the western coast of Greece, between the Pindos mountains and the Ionian Sea lies the stunning coastline of Epirus. This is a holiday region that demands exploration. With amazing natural beauty, there's plenty of outdoor exploits to enjoy! Hike through heavenly trails or take a ride on the wild side and raft down winding rivers. There's never a dull moment in this beautiful paradise. Epirus is revered for its unspoiled landscapes and charming simplicity. All along the coast are beaches and bays tucked away awaiting discovery. Hiring out a boat will let you explore the stunning coastline where you can find your own private bay for an afternoon. As you explore the region you'll discover rivers, valleys and mountain trails connecting them all. Carpeted by lush green forests there's no end to what you can do! From hiking to mountain biking, or simply wandering along a river bank. For a sedate pace explore one of the many national parks in the area. Perfect for hiking, exploring and taking in the best the region has to offer – head to the Pindos National Park. This park is covered in dense pine forest, rocky mountain ridges, rushing rivers and fresh springs, and is an important habitat for a great number of species. Relax the day away as you row the Ioannina Lake or wander around the National Park of Amvrakikos Wetlands. Epirus is filled with meandering rivers, gorgeous gorges and peaceful lakes. The river Aoos is well known for its kayaking, with beautiful (but challenging) rapids that are perfect for adrenaline seekers. Arachthos River offers unique trails, with the wild gorge and two of the most famous Epirus bridges; Plaka and Arta to conquer. If Vikos Ravine is a true miracle of nature, then Voidomatis River is definitely its precious gem. It's a river with sparkling clean waters, ideal for your first rafting experience. Greece is rich in history, mythology and culture. However, even by Greece's high standards Epirus is well catered for! Written about in Homer's Odyssey, the region was also home to several of the famous oracles in ancient times. One oracle mentioned is the Necromanteion, by the Acheron River, which was believed to be the door to Hades. Mixing nature and mythology, it's said to be one of the five rivers of the underworld. Now you can kayak it and marvel at the natural beauty of the region. By the coast there's Parga Castle. Built in the 11th century by Venetian settlers, this castle held off invaders and pirates for centuries. Perched overlooking the town, the castle provides magnificent views over Parga and the Ionian Sea. The stone trails that encircle the castle are shaded by cypress trees and is a serene, peaceful place to take an afternoon stroll. The largest archaeological site in the region is the site of Nikopolis. Founded by Augustus Ceaser to celebrate his victory of Mark Antony and Cleopatra at Actium in the 1st century BC. The settlement blossomed into a powerful urban centre in Epirus and has both Roman and Byzantine monuments. Be sure to check out are the mammoth walls guarding the city, the Odeon, a theatre, the Roman villa of Antonius, the nympheum, a monument to the victory at Actium and fragments of an aqueduct. 'The little island' is what Menorca roughly translates to. Yes, it's small compared to neighbouring Mallorca, but good things come in small packages and this fits the bill perfectly. Any holiday here will pack a real punch! Ciutadella is Menorca's original capital and the pinnacle of rustic island life. Elegant picturesque architecture couples with cobbled lanes and a beautiful town square, making this one of the most charming spots to visit. On an island of wonders, this is just one of many treasures that you'll discover. 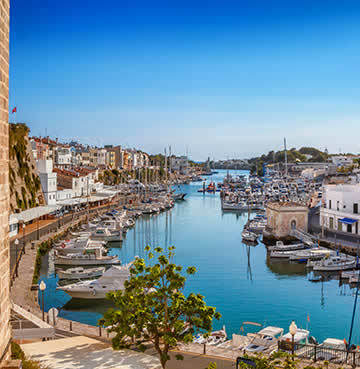 If Ciutadella whet your appetite, you can always visit Menorca's 'now' capital, Mahon. This beautiful port town is filled with restaurants, bars, boutiques, and a gin distillery (that makes a unique type of gin exclusive to the island). Not to mention you can hire a boat trip to explore the stunning untouched coast. With over 200 coves and bays to discover, Menorca's beaches all bring something unique to the table. The coastline is a listed Biosphere Reserve, meaning it protects the natural scenic beauty and wildlife that calls the waters home. The beaches here are pristine snapshots of paradise, with the cerulean waters of the Balearic Sea lapping gently against ivory white sands. On an island with an incredible amount of stunning beaches, Cala Galdana is definitely one of the most picturesque. A crescent shaped bay guarded by pine trees along its cliffs, the crystal clear waters match perfectly with the white sand. There are plenty of facilities and the calm shallow waters make it perfect for swimming and splashing about with the kids. As the sun sets, this is where Menorca breaks out from the crowd. There's plenty of restaurants bars and nightlife to indulge in. Being a Mediterranean island there's a natural focus on seafood and you'll find some of the greatest gastronomic delights here. There's mountains of delicious delights to try, including bacalao ab burrida (cod meatballs) – which are served in a garlic white sauce similar to aioli – and albondigas de cabracho (scorpion fish meatballs), which are sometimes accompanied by a rich tomato sauce.The "Little Island" is also famous for its cheese. So why not try Mahon Cheese? A local cows cheese made under strict control that's highly prized by the Spanish. 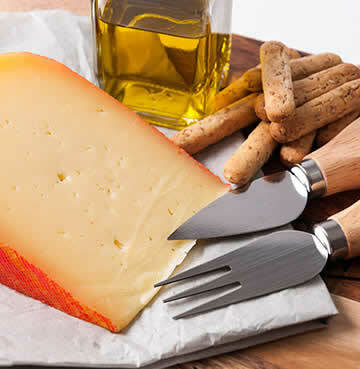 Thanks to the sea air this cheese has a salty tang, with producers rubbing butter and paprika into the cheese during maturation to add a richer flavour. More of a drink person? Why not have a tipple with Menorca's favourite drink: Gin. A throwback to past British influences is the islands own style of Gin. Created at the Xoriguer Gin Distillery to this day since the 18th Century on the dockside at Mahon harbour, you can have a tour around the distillery and try some of this delicious drink before you buy a bottle (or two)! For a truly unique experience travel to one of Menorca's famous bars. There's even one nestled inside a cliff face and its caves. As you drink some of the local cocktails, such as Pomada – a unique gin and lemonade mix, look out over the sea and watch the sunset dip and dance into the horizon. Another perfect end to a perfect day!